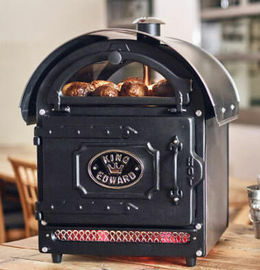 Our potato ovens are hand finished to exacting standards in beautiful vitreous enamel colours and also available in stainless steel with chrome. Need a little inspiration on how to get those baked potatoes restaurant perfect? Here's a few hints with some exciting fillings! 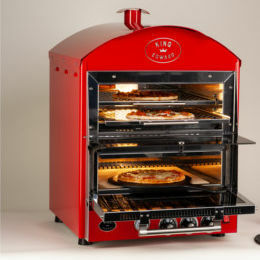 Our range of four highly efficient, countertop pizza ovens, encompass the handmade British quality and highly visual appeal that King Edward are renown for. Need a little inspiration on how to get those pizzas restaurant perfect? Here's a few hints and some exciting toppings! PHPSESSID Authentication session to prevent having to login multiple times in one browser session. Hashed data of username and authentication status. Expires on exit. We use a number of suppliers who may also set cookies on their websites' on its behalf. www.kingedward.co.uk does not control the dissemination of these cookies. You should check the third party websites for more information about these. Our products can be found in the restaurants of most major retailers throughout the UK.